Create your ideal skin-benefiting foundation or tinted moisturiser with the award-winning Cover FX Custom Cover Drops; revolutionary drops of pure pigment designed to transform your favourite oils, serums and creams in your daily skincare regime. With customisable levels of coverage, the pigment drops offer endless possibilities; it can even be mixed with mattifying primers and lightweight lotions for a matte finish. 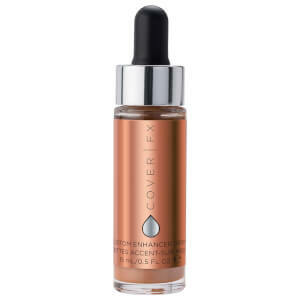 For sheer coverage, just add one drop; for extra full coverage, add just four, then shake and voila! Free from parabens, fragrance, gluten, mineral oil and talc. For best results prep your skin as you normally would with your usual skin care regimen and Primer application. This unique formula must be shaken well prior to use. Place your favourite beauty product into the palm of your hand. Drop in your desired number of Custom Cover Drops: one drop for sheer coverage, two drops for medium coverage, three drops for full coverage, and four drops for extra full coverage. Mix together with your fingertips to transform into your ideal foundation. Apply as you would any foundation. For best results we suggest using the Custom Blending Brush was designed for the seamless application of any level of coverage or finish created with Custom Cover Drops. Ethyl Trisiloxane, Caprylyl Methicone, Bis-Hydroxyethoxypropyl Dimethicone, Isododecane, Dimethicone, Mica, Jojoba Esters, Triethylhexanoin, Disteardimonium Hectorite, Silica, Hydrogenated Lecithin, Dimethicone/Vinyl Dimethicone Crosspolymer, Helianthus Annuus (Sunflower) Seed Wax, 1,2-Hexanediol, Caprylyl Glycol, PEG-10 Dimethicone, Water (Aqua, Eau), Alcohol, Acacia Decurrens Flower Wax, Polyglycerin-3. May Contain: Titanium Dioxide (CI 77891), Iron Oxides (CI 77491, CI 77492, CI 77499).